The Kodak EasyShare M580 is a compact 14-Megapixel camera with a versatile 8x optical zoom lens, face detection and recognition, and 720p HD video capture. It performs well and captures great images when using Smart Capture. Read more in our Full Conclusion. 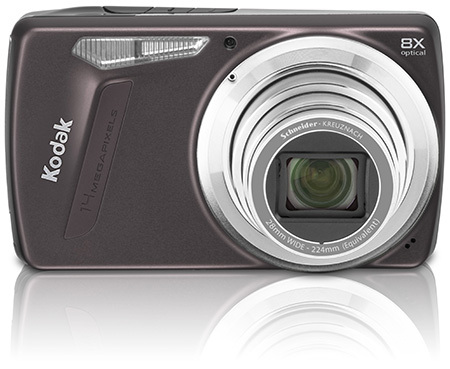 The 14-Megapixel Kodak EasyShare M580 is a stylish and compact digicam that has made it even easier to share your images. This camera allows you to tag your images inside the camera, allowing you to connect the camera to your computer and automatically upload your images with the tags intact, to Facebook, Youtube, FLICKR and Kodak galleries (with the included USB cable). The camera also features a wide, 8x optical zoom lens, image stabilization, 720p HD video, Smart Capture and Face Recognition. The Kodak EasyShare M580 is available now with a MSRP of US $199.95.